If you want to keep your internet traffic safe and secure you need a VPN. Without one, you can be spied on, hacked, robbed and have your traffic throttled. Getting a VPN puts you back in control. VPNs can vary a lot in price. And you don’t always ‘get what you pay for’ — there are some great deals on low-cost, high-value VPNs, while other services can be overpriced for what they deliver. Sometimes that’s just because they have to charge more to survive. Sometimes a VPN that offers one special benefit will be more expensive than others, but still the best deal if you need that benefit. For instance, ExpressVPN is among the fastest out there, but it’s a little more expensive than the average. It’s worth it if you want the speed, but over the odds if you don’t. That means that to get the cheapest VPN, you need to make sure you know what you want from your VPN.We’ve assembled this list to show the cheapest VPNs on offer, and what you get for your money. But there’s a snag: how do we list them? Just going from low to high price ignores value. If you get a lot more features for a little more money, shouldn’t that be reflected in where that VPN appears on the list? Additionally, some VPNs are cheaper for a month or for three months, but far, far more expensive for a year or two years. We’ve listed our cheapest VPNs in terms of value overall, then, and tried to be clear about why they’re where they are in the list. Are you interested in privacy? Are you interested in streaming? Privacy is one of the most common reasons to use a VPN, and everyone should use one — for this if for no other reason. The good news is that the top VPNs for price and performance are typically also best for privacy. So if privacy is your main concern, and you’re an average person, you should be fine with a VPN like NordVPN, which is among the lowest-priced options as well as one of the best. Streaming from geo-restricted services can require a VPN with special features. Generically known as ‘obfuscation,’ these are tools that hide the fact that you’re using a VPN so you don’t get zapped by VPN blockers when you’re watching your favourite shows while you’re out of town. But there’s another reason to use a VPN for streaming: throttling. Some ISPs will slow your traffic down if they think it’s streaming video because it’s data-heavy and makes life more difficult for them. A VPN conceals the type of traffic you’re sending and receiving and thus frees you from throttling. Businesses have different requirements from a VPN. Most consumer VPNs give you five or six devices, and allow you to add more cheaply and easily. But even a small business might need more devices off the bat, or router-compatible VPN. Typically, business VPNs are priced on a per-seat basis like business SaaS products, rather than as a one-size-fits-all subscription for multiple devices as with consumer VPNs. If you’re shopping for a business VPN, your pricing and feature needs will be different. Gamers need a VPN that doesn’t slow them down. Unlike streaming, gamers need a different type of speed. They should look at the network response (ping) rather than at upload and download, because it’s high ping that causes lag and glitchy gameplay. You also need to make sure there’s a fast enough server in the right location if you’re playing geo-restricted games on the move. P2P networking is awesome. But not every VPN offers equal support for P2P and torrenting. Before you pick a VPN, check that it actually offers plenty of fast servers in the areas you need and that they allow torrenting! Click on the links to be taken to the relevant paragraph. Nord is among the best VPNs out there. With 5114 servers across 62 countries, Nord gives you a huge range of IPs to access the web from. It offers military-grade 256-bit AES encryption over IKEv2/IPsec and OpenVPN, mobile apps, and double VPN: traffic is routed to one Nord server, which redirects it to another, which in turn redirects it to its destination, double-encrypting it and making it far harder to figure out your real IP. How does Nord’s pricing stack up? It’s cheapest standard plan is the 1-year plan at $6.99/mo — a good price for the features it offers. But Nord has a frequently-running special promotion that lets you get two years for a one-off payment of £3.99. And their security checks out too: multiple protocols including OpenVPN and IKEv2, and AES-256 encryption. However, you should be aware that they have a relatively small server net, and that torrenting is allowed only on specific servers on the SaferVPN network. They don’t keep logs of user activity, but do log some metadata. 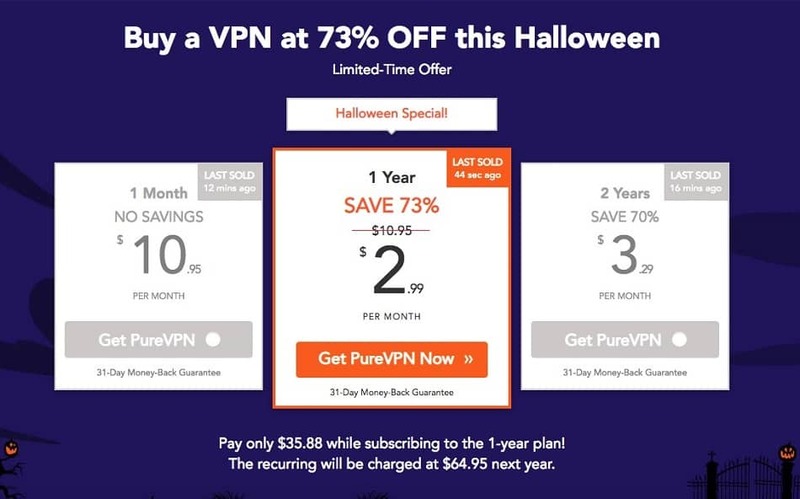 SaferVPN offers a $3.29/mo deal for a 2-year plan, payable as a $78.96 lump every 2 years. But its yearly price, $5.49/mo, is pretty competitive too. Finally the monthly price of $10.99/mo is about normal, not conspicuously high or low. Fast, easy to use and with 256-bit AES encryption, PureVPN is a good choice for gaming, streaming and browsing. They make a point of being streaming-friendly, and there’s a wide range of P2P-friendly servers too. You pay $2.99/mo when you sign up to a 1-year plan — $35.88, a hard price to beat. With over a thousand servers in more than 60 countries, IPVanish is a decent choice for a VPN for most uses. It’s among the fastest VPNs in the world, and comes with a solid features list, including AES-256 over OpenVPN and L2TP/IPsec encryption. How does IPVanish’s pricing look? Like most VPNs, IPVanish has reductions for buying longer subscriptions. Buy a year in one go and pay $77.99 — just $6.49/mo. It’s slightly cheaper than many others for one month, 6 months and even one year, but can’t beat Nord’s 2-year deal. TunnelBear keeps connection logs but not traffic or activity logs, and its 1-year price is pretty solid. It’s also the only service on this list to offer a free version with most of its paid-for features. Until recently TunnelBear didn’t allow torrents, but it now says it ‘doesn’t have a stance either way,’ recommending P2P on servers in Canada, US, UK, Romania, Netherlands, Germany, or Sweden. 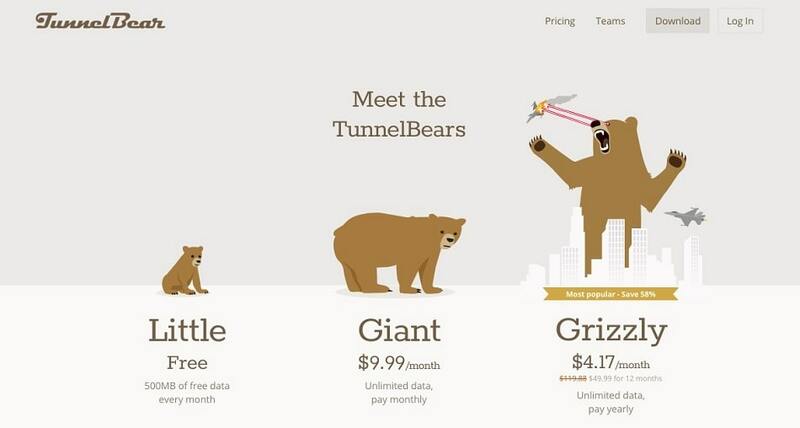 TunnelBear has a fun pricing page. But it also has pretty fair pricing: 500MB free a month, or $4.17/mo for a year payable as a $49.99 lump annually.